Charlie considers his options. The toy basket is looking good. I knew it would be a matter of time before Charlie chewed something again. The first incident was when he chewed the wood muntin/window pane divider in the front room. Unfortunately, I was not home when it occurred, so I lost the opportunity to positively reinforce the idea of eating a squeaky squirrel instead. Being a sensitive border collie, Charlie acted like he was shot through the heart. Squeaky toys were presented as peace offerings. And soon enough, he was wiggling and snuggling like usual. Up til now, we’ve been unbelievably lucky. 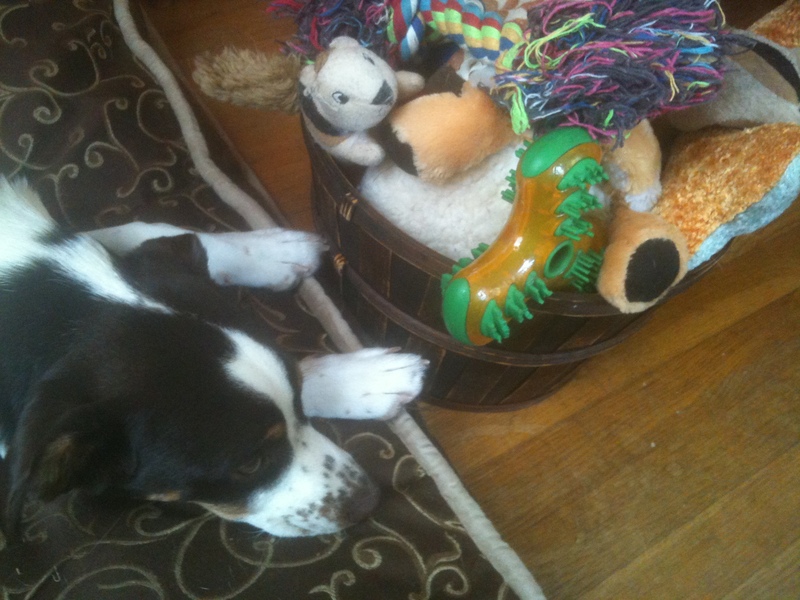 Charlie loves his basket of toys. I fill it up, then he unpacks it one squeaker at a time. He’s only defluffed one toy, a squeaky giraffe, but we actually don’t have proof he did it. The alleged stuffing assault took place while Charlie and Lex shared a cabin at Camp Bow Wow. Lex has pleaded the Fifth. BONUS FOOTAGE: Charlie bites a spider … or is it the other way around? As of today, Matt and I still have all pairs of our shoes. And not one book has teeth marks in it. Believe me, I know that I have it good. I once owned a dog that ate my cellphone, completely deconstructed a couch and jumped through a window. So chewing on the corner of a rug seems like small potatoes. Still, I know it’s destructive behavior. He was bound to have some growing pains. We need to address it swiftly, in a positive manner. But Charlie is smart. With the right direction and reinforcement, he’ll continue to grow into a model canine. In the meantime, I’ll be investigating dog obedience classes. This entry was posted in Videos, Woof! and tagged adopt, border collie, chew, dog, obedience, puppy, rescue by ourfureverfamily. Bookmark the permalink. every now and then Pickles will chew up an antique book. ONLY the antique ones. she will move things to get to them and pull them off a tight bookshelf. Uuugh! I once had a dog that only settled for my journals. I even moved them to a small chest, and that lil fuzzball still found a way to get to them. I hope your books were salvageable! I’m as lucky as you, I hear what people went through with their puppies and I count my blessings, apart from the step Doggy chewed he has always preferred his toys or milk bones and of course plastic bottles over my snickers. Aw, the puppy years. I can’t even imagine how many pairs of shoes I’ve lost to the darkest depths of my dogs’ jowels. As cute as they are at that age, I must say I don’t miss it! I feel your pain. Years ago I had a dog that ate her way through half the carpet in my front room. I kissed that security deposit goodbye!